The Tesla Model S is one of the safest cars in the world, according to Tesla CEO Elon Musk. Despite a few fires involving the Model S, electric cars, in general, are inherently safe. In fact, statistics shows that ICE cars are far more likely to catch fire following a collision than an electric car and that's precisely what we're seeing here. 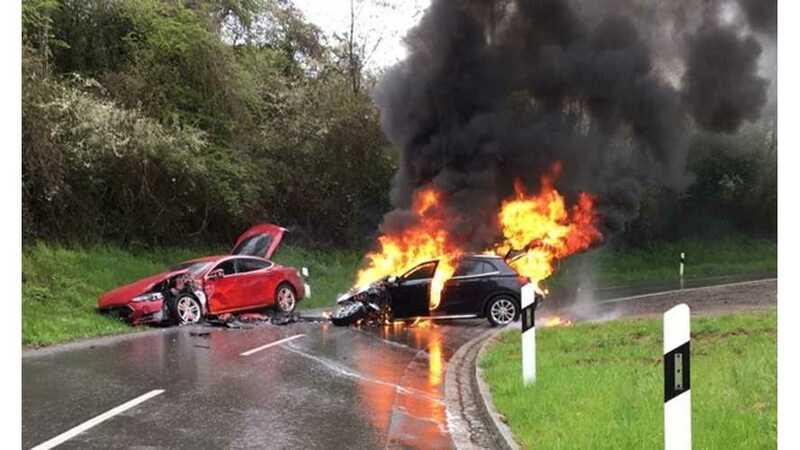 The image above captures the aftermath of what appears to be a rather serious collision involving a Tesla Model S and a compact, gas-fueled car. The accident occurred yesterday evening in Contern, Luxembourg. "Few details were given about the circumstances of the accident that led to this quite impressive shot. All we know for now is that there was a collision between Contern and Syren around 15:00 and a car was in flames." What the image does capture is what we'd expect to see...a damaged electric car not on fire, with the gas-fed car engulfed in flames. This would be the most common scenario, not the other way around. There's no info as to the status of the occupants of either car available to us at this time.